If you are using single use cameras to enable guests to take photos at your event, be sure to put these camera table signs near the cameras so that guests know what to do. They will enjoy capturing your celebration on film! 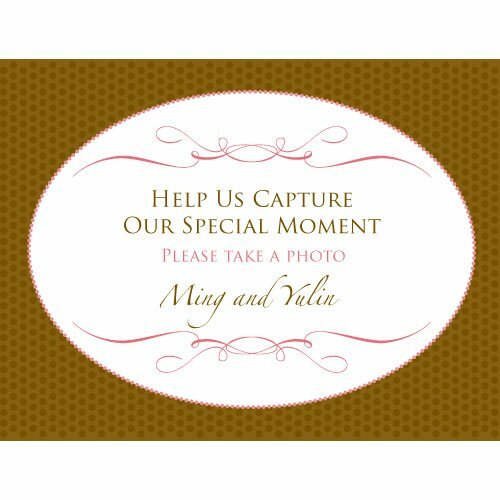 Each sign has a white oval background that reads "HELP US CAPTURE OUR SPECIAL MOMENT Please Take a Photo" and can be customized with your names. Sold individually with a minimum of 24 required for purchase. 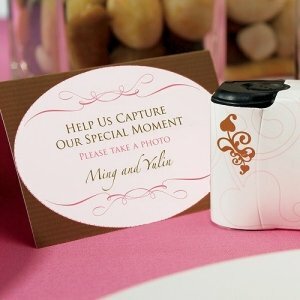 Note - This item includes a personalization, color, size or design option: Text Line 1 (e.g., Bride & Groom Names) (max of 26 characters) (Free of charge). You may specify this information during our checkout process.